"If you love horses and appreciate the countless gifts they bring to our lives, you will want to keep this exceptional collection of heartwarming stories close to your bedside for inspirational reading. Angel Horses is a rare gift to the world of equines." The deep soul connection between horses and humans has long been celebrated in song and myth. 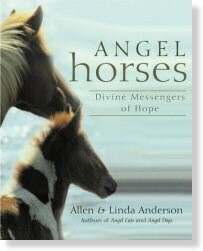 This collection of true stories carries on that tradition, highlighting horses' unique ability to hear divine messages, intuitively communicate them, and transform despair into hope. Whether granting disable riders a sense of freedom, healing wounds of childhood abuse, giving troubled teens and lost souls a sense of purpose, rescuing people from danger, practicing intricate dressage moves, or showing that love endures beyond mortality, horses bond with people in ways that change their lives forever. Cholla is the horse who paints works of art that appear in museums and galleries. A veterinarian was reminded of the importance of compassion by a dying horse and a Native American chief. A horse saved a teenage girl from influences of the wrong crowd. A late-blooming rider got embarrassed by a horse and learned an important lesson about respecting the feelings of others. An emotionally abused little girl found an unexpected healing with a rescued horse. You don't have to be a horse enthusiast to fall in love with this book. You'll discover the true meaning of having "good horse sense" when you let these stories take you for the ride of your life. "...Horses are sensitive to everything and everyone around them. This makes them both receptors and messengers for God, Divine, Spirit, the Sacred, or whatever you want to call the love that flows through all creation. Perhaps because they are prey animals, horses have had to learn how to tune in to the slightest changes in their inner worlds and outer environments. We learned by writing this book that if you are ever in doubt about the direction to take in your life and you need a second opinion, you couldn't do better that to listen to a horse's advise." Click www.angelanimals.net to visit the Angel Animals Network. "For cultures as diverse as the Celts and the Plains Indians, horses not only represent 'the other' but are considered an oracle, a link to the spirit world. So, too, the horses we meet in Allen and Linda Anderson's collection of stories come to us equine messengers who, if we are willing to listen, remind us of our own roles and responsibilities to all sentient beings. The stories in Angel Horses are told with passion and insight into the horse-human bond." Visit http://archive.mail-list.com/angelanimals to read past Angel Animals newsletters. The term Angel Horses ™ is a trademark term.